I love this baked chicken dinner recipe. It is so simple, yet so flavorful! 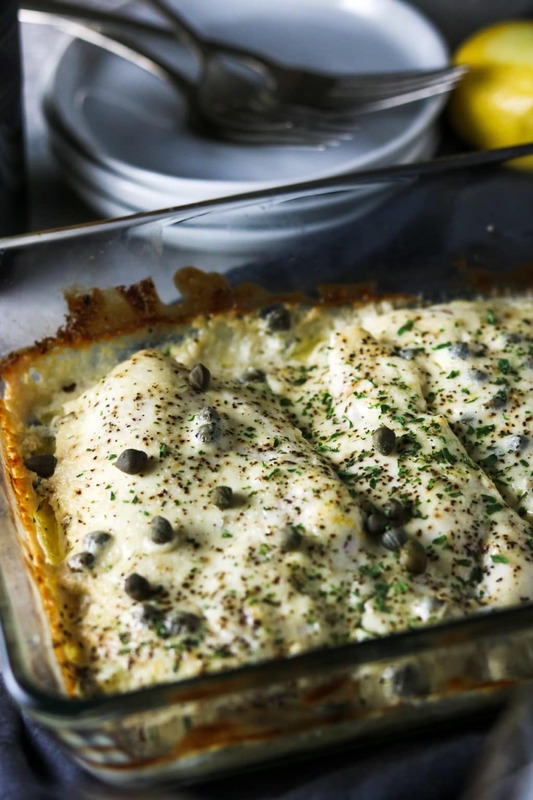 Chicken breasts are baked in a Caesar style cream sauce that is made with garlic, Greek yogurt, Dijon, mayo, fresh lemon, and capers. It makes such a great cream sauce for chicken. 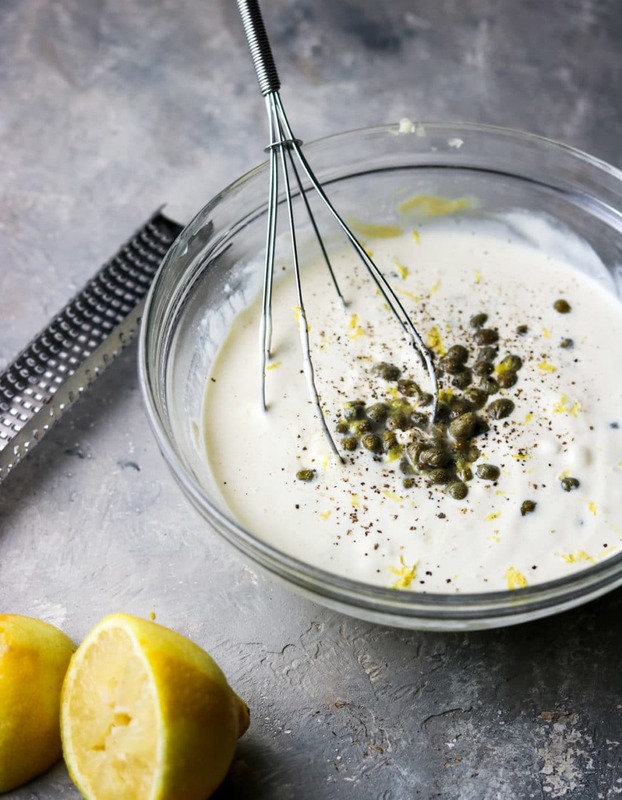 It is a creamy sauce from the Greek Yogurt and mayo, citrus-y and fresh from the lemon, a little bite from the garlic, and a tang from the capers. There is no sauteing or long prep for this dish. You simply season your chicken breasts with olive oil, salt and pepper and then mix the Caesar sauce, pour half of it over the chicken, and bake. Save the other half of the sauce for serving. Such an easy dinner! I live in Kansas and I’m guessing any swordfish I could get my hands on would be, well, not so great. So I adapted the recipe to be made with chicken. 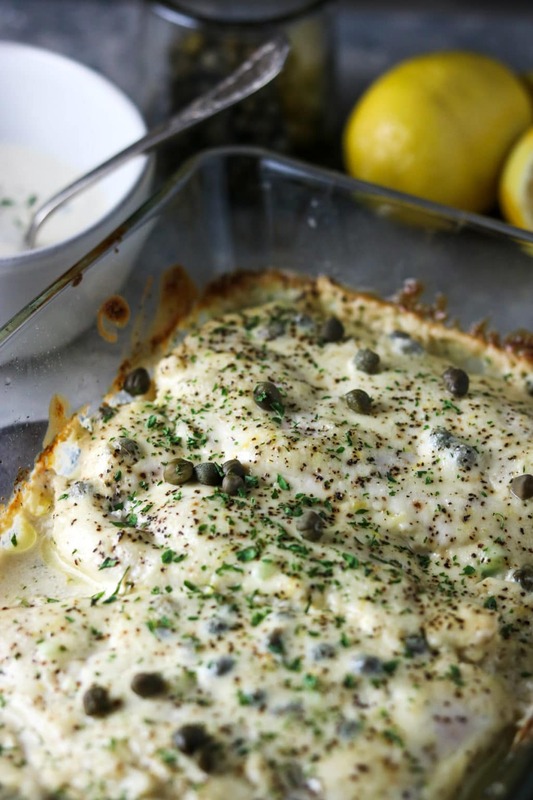 For this Creamy Caesar Chicken Bake I use boneless skinless chicken breasts. Sometimes, when I buy boneless skinless chicken breasts I find that they are too thick to cook thru completely in a “normal” amount of time, about 25 minutes. You end up cooking it for 45 minutes+ to reach an internal temp of 165, and half is dry & over-cooked and the other half is just cooked thru. To alleviate this problem I like to slice my chicken breasts in half, lengthwise, so you end up with two thinner chicken breasts. It creates an even cooking chicken, that is done in about 25 minutes at 350 degrees. If you already have thin or smaller chicken breasts do not worry about this step. In a mixing bowl combine the Greek yogurt, mayo, Dijon mustard, fresh garlic, lemon zest, lemon juice, capers, salt & pepper. Whisk it all together until it is well mixed. Place your chicken breasts in a baking dish. Season the chicken breasts with olive oil, a little salt & pepper. Pour half of the Caesar sauce over the chicken and, with clean hands, slather both sides of the chicken breasts with the cream sauce. Pop into the oven for 25 minutes, until the chicken reaches 165 degrees at it’s thickest part. 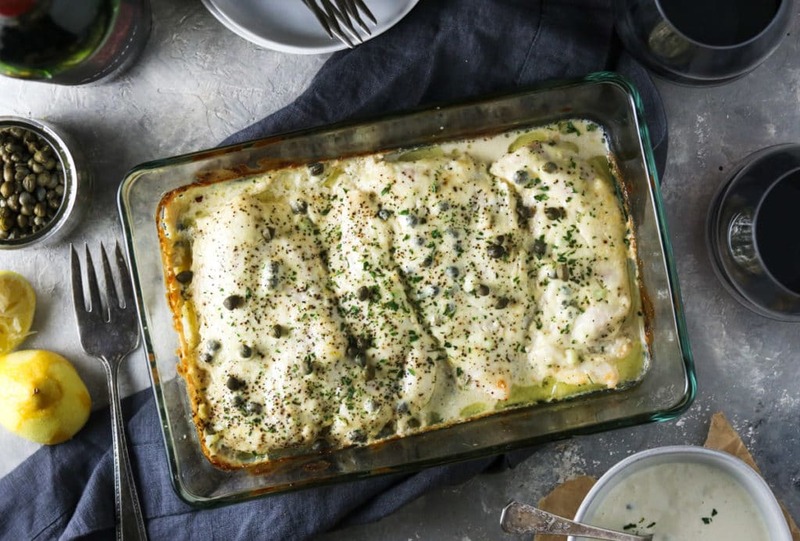 Serve the Creamy Caesar Chicken Bake with the remaining sauce on the side. This recipe for Caesar Chicken Bake is such a versatile recipe. It is delicious enough to plan for entertaining, yet easy enough to plan during the week. I hope you give this recipe for Creamy Caesar Chicken Bake a try in your kitchen. 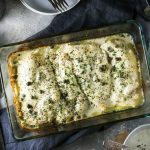 A delicious oven baked chicken dinner that is covered in a wonderful Caesar style sauce. This is SUPER EASY chicken recipe to make on a weeknight or for entertaining. Simply whisk the sauce together, pour it over the chicken, bake for 25 minutes, and dinner is ready. Place the chicken breasts in a glass baking dish. Drizzle with a little olive oil, and just a pinch of salt and pepper (remember the sauce also has salt). Whisk together all the ingredients for the Caesar Cream Sauce, until it is well combined. Pour HALF of the Caesar Cream Sauce over the chicken. Using clean hands, slather the sauce onto both side of the chicken. Bake, uncovered, for 25 minutes, until your chicken reaches 165 degrees at it's thickest point and is cooked thru. 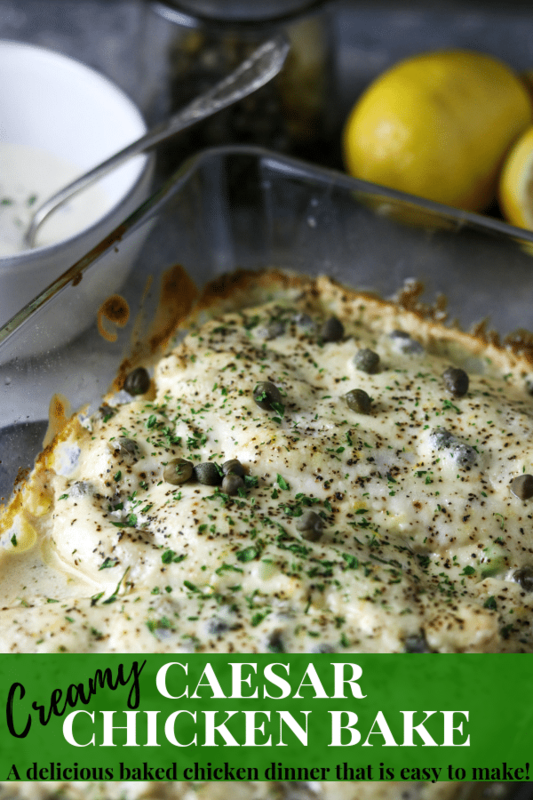 Serve the Creamy Caesar Chicken Bake with the remaining cream sauce on the side. Boneless Skinless Chicken Breasts- If your chicken breasts are very thick, Only use 2 and split them in half, lengthwise. This will help them cook more evenly. This recipe is easily doubled or tripled for a larger crowd. To get the correct measurements, simply click on the serving size at the top of the recipe and slide to the amount of people you will be serving, it will change the amounts in the recipe for you!! I am all about easy dinners – this looks amazing! I’m loving this recipe thank you so much for sharing!! Such a flavorful chicken recipe!